I can only imagine how great it would have been to find a big resource list like this back when I started blogging. There are tonnes of incredible websites out there just sitting around waiting for you to utilise, to make the whole process of blogging, designing and creating so much more efficient. 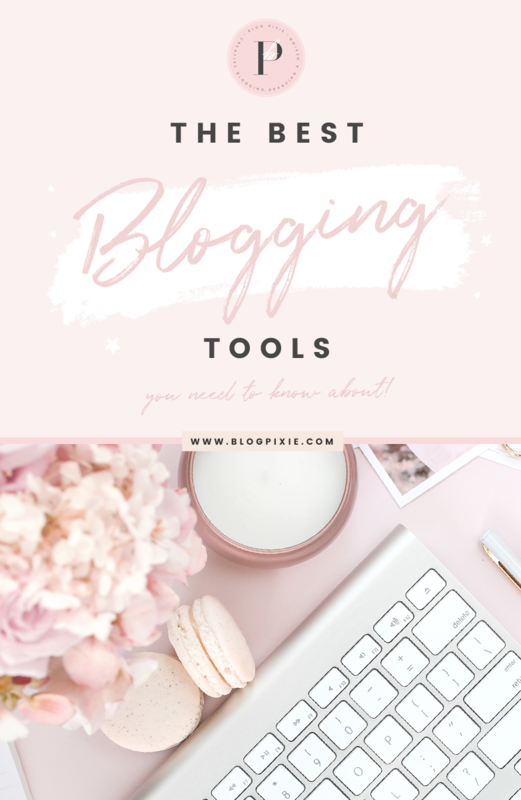 So here I have for you a wonderful big list of resources for bloggers! I’ve been searching around for a while now, adding to this list as well as finding the best things inside some of these websites, so you can really make the most of them. Hope it helps you out! I’ll start with the most popular posts on Blog Pixie! So many people have found these fun to read or very useful, so I hope you do as well! Bluehost is the best hosting to go with if you’ve decided to start a self-hosted WordPress blog, website or online store. They’re affordable and it’s incredibly easy to start a blog on your very own domain and have it up and running in no time. When you buy hosting with Bluehost, you get to create your domain (yourblogname.com) for free at the same time so everything is sorted, and if you pay for 3 years up front you’ll get the best value for your money. If you have a blog on Blogger.com and you would like your own domain instead of a blogspot address, I recommend GoDaddy 100%. I’ve been using them for so long now, the domains are affordable and it’s really easy to set your domain up on your blog. Just google search ‘how to add godaddy domain to blogger’ and you’ll find easy instructions. I feel like I spend most of my money on this website! There’s just so many good things to buy for the creation of your blog and the graphics to go with it. Creative Market is where I found all sorts of different fonts, graphics and brushes that I use on a daily basis! You can find blog themes, stock photography, media kit templates and so much more. I have my own shop on Creative Market if you want to visit! If you find Photoshop too complicated to understand and you’re looking for a design program that’s quick and easy to use, PicMonkey is for you. The free plan on this website will get you the very basic features – editing, touch ups and fonts. The Royal plan gives you access to more advanced tools with templates, better fonts and the ability to go back and edit your projects after you’ve saved them. If you have the time and patience, Photoshop is so worth learning how to use! I always have it open on my computer and I use it for everything including my blog post graphics, logos, side bar graphics, photo editing and the creation of my yearly blog Media Kit. It is quite costly to subscribe to, however if you’re using it on a daily basis and you are creating graphics that contribute to the success of your blog, then it’s worth every dollar. If you’re just starting to play around with new fonts, this is a great site to download them for free. You can find lots of fonts that are free for personal use, meaning you can use them in projects that aren’t to be sold. There are also Demo fonts which enable you to download them for free, test them out and then if you want to use them in a personal or commercial project, you can purchase the font. Just check beside each font what it says in regards to how you can use it, or read through the little document that comes in each download folder. Just like PicMonkey, Canva takes the stress out of trying to learn Photoshop. If you want a program where you can create pinnable blog post graphics, social media graphics and anything else where images and text are combined, Canva is super easy to use. They even have great templates to use if you’re stuck on where to begin. I was so happy when I found this website, as it’s so similar to Photoshop! I know a lot of people can’t afford to purchase Photoshop or pay the subscription fee, so this is such a good alternative and it’s free to use. You can create a new document at any size you like, add text, add layers and lots more. This social media scheduler is great if you want to be super organised with social media and if you’re trying to get your posts on both FB and Twitter seen at different time zones (you want as many people to see your posts as possible!). It’s a great platform to keep on top of it all in the one place. It also includes Instagram and Google plus so you can really take control of all your social media accounts here! Whenever I’m posting to Twitter or Facebook I love to use Emojis. They add a touch of personality and interest to whatever you have to say, and are just fun in general. This site has every possible emoji you can scroll through. If you’re at your computer and want to add something to a social media platform that doesn’t have the option to select an Emoji, you can simply copy and paste one in from this site. This is the platform I used to sell the Blog Pretty eBook and I really have only good things to say about it! It was easy to set up my product to sell, to grab the selling button URL for the button on my sales page, to track sales and to run my Affiliate program. I created the Blog Pixie Etsy store as an extra selling platform for my templates and blog kits. There is a whole community of customers on there that you can get amongst if you have products to sell, whether tangible products like mugs or prints, or digital products. I love it for the reason that so many people go there to search for the types of items I sell, so it’s a great way to have your products shown to so many customers that you may not have found otherwise. WooCommerce is a WordPress plugin that you install to your blog to run an online shop, if the theme you’ve installed allows you to do so. You add your products, choose your payment gateway and sell everything through your WordPress blog! It’s a great way to keep track of everything in the one place. If you plan to run a store on your website, always make sure you choose a theme which is ‘Woocommerce ready’, such as the themes at Hello You Designs. If you’re looking for stylish, feminine themes for your WordPress blog, this site has some beautiful ones. They give your blog the look of being a professional website rather than “just a blog”, so if you ever want to run a business along with your blog and need a shop, having one of these themes is perfect. Don’t you hate it when you go to send a document or photo to someone via email and it tells you the file size is too large? With WeTransfer you can send files up to 2GB in size (20GB with the Plus plan) for free. I used this website like crazy during the creation of my eBook, as with all the graphics included it was a big file to send. My email provider just couldn’t do the job! This app has become so helpful lately! I have it on both my computer and phone, and as I have an account it syncs my lists up to both. You can create categorised lists with points to check off, and as you check an item off the list it makes a cute “ding!” sound and disappears. I love to use this for blog post ideas, tasks and instagram post ideas. This website is great for those who are just starting out with their blog mailing list. It’s super easy to create great looking emails. You can have lists for different groups of people and select who you want to send particular emails to. You can also track who opens the email, who unsubscribes and who clicks on the links inside your email. If you’ve ever been onto blogs that offer something for free if you sign up to their mailing list, they’re most likely using Convertkit. It’s not easy to collect email addresses, so offering an incentive for signing up and having it sent off immediately to every new subscriber is a great way to draw people in and so many bloggers are building email lists of thousands using this program.